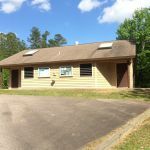 Ask fellow campers about "Medoc Mountain State Park" and nearby attractions. We stayed one night in a 40 foot fifth wheel. I have a bit of a mixed and frustrating view. We drove 20 miles from I95 to this park just to stay in a state park in a more natural setting. This was after securing a reservation by phone for an electric only site that was a pull thru. The park is in a beautiful setting, plenty of trails to enjoy if we had the time. 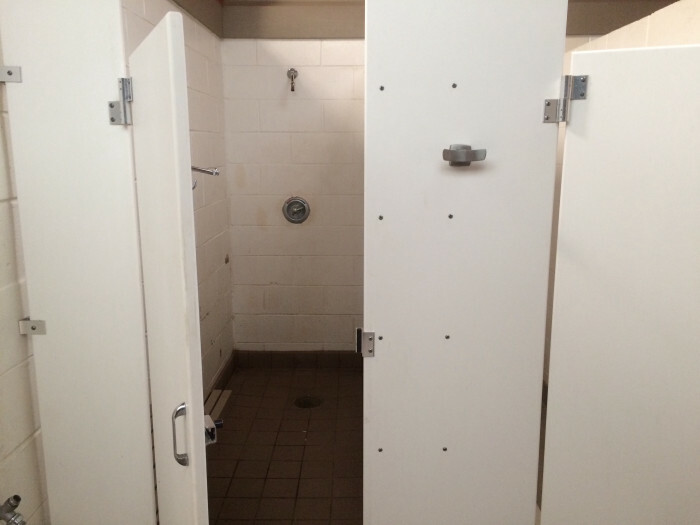 Restroom were clean and sites were level. Though the electric had 50 amp outlets, the circuit breakers looked like 30 amp Didn't really matter as we could not get into the site. So this was our frustration. There is no way to pull a 40 foot fifth wheel into this site as there is a tree on the approach curve that you cannot get around. Trying to back in was equally frustrating as there were obstacles on 4x4 posts including site markers and garbage cans as well as water spigots. I am an experienced driver...I made several attempts to get into site 32 but simply could not. Accordingly, we backed into site 33 and spent the night with no hookups. Nice site other than no hookups. I think this is a great campground for smaller campers. 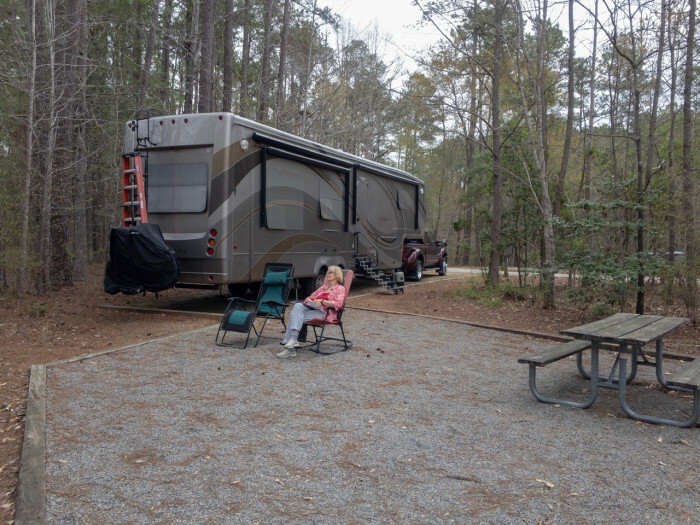 We camped at Medoc Mountain State Park in a Fifth Wheel. We stayed for six nights, over the Memorial Day Holiday Weekend. This is a very small park, with only 34 sites, of which only 12 have electric. Easy access to the park, and paved roads within. Sites are all gravel/dirt and seemed to be fairly level, and easy access to back in. We were disappointed to discover there is not much to do in the area, and many whom we asked, did not have much to offer about the area. We drove to Roanoke Rapids hoping to ride our bicycles on the Roanoke Canal Trail. We had difficulty even finding the trail or anyone that knew about it or where it was at. Worst ever bicycle trail I have ever been on. We also drove up to Lake Gaston area. Huge lake, but again not much going on in that area. Little Fishing Creek that flows thru the park for canoeists was closed or not encouraged to use because of a tree that was down. Overall, the park is nice but very small with not much to do. It was an OK stay, and I would return again if only passing through. 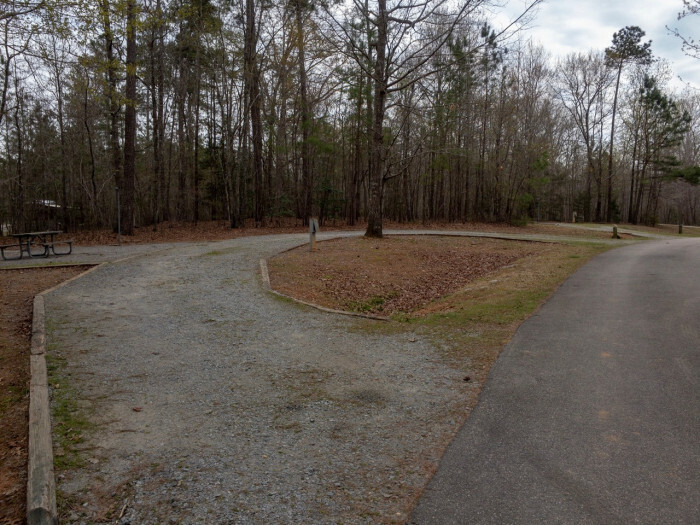 We camped at Medoc Mountain State Park in a Fifth Wheel. Not much to do or see in the area. This is a great stop if you are traveling on 95. It is a bit off the road but well worth it. The park offers partly shaded spots and clean bathrooms with hot showers included in your campsite fee. 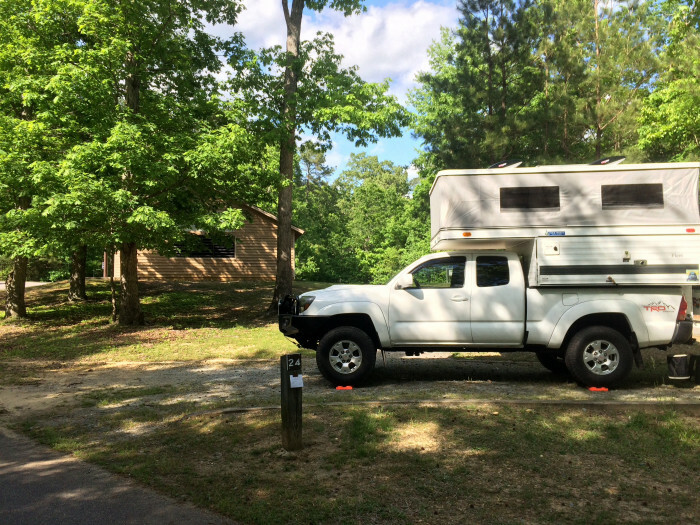 We camped at Medoc Mountain State Park in a Truck Camper. What a gem of a park! Came to Medoc Mountain for a quick weekend getaway. Small well kept campground. Our site was private, level, and very nice. Spent 2 days hiking and enjoying the park. We never left park during our trip. 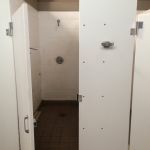 Bath houses were cleaner than we expected for a state park. Visitor center was closed for renovations so we were unable to check that out. Will definitely return for more quick getaways. We camped at Medoc Mountain State Park in a Motorhome. A small (only 34 spots) but relatively new (or refurbished) state park. Our site required minimal leveling. Interior roads were all paved and easy to navigate -- no low-hanging branches. The camp hosts were visible and attentive. 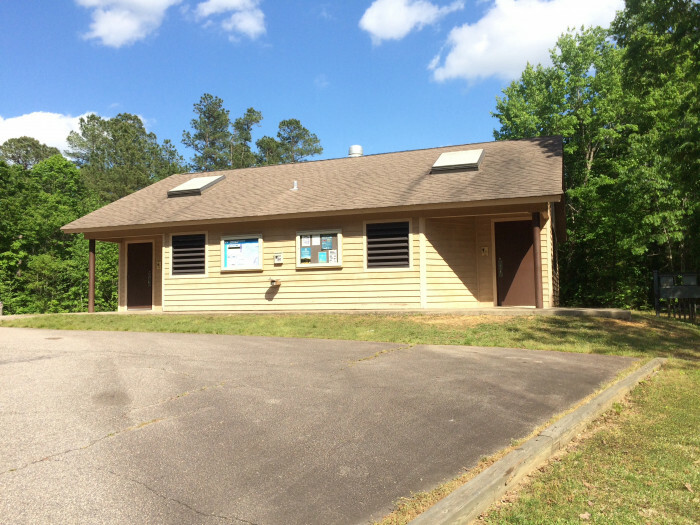 Unlike other NC State Parks, the bath house seemed quite new and was spacious. Showers were hot and had great water pressure. Half the sites have electric, none have individual water. There are communal water spigots throughout the campground, but they don't easily allow hose connections, so be sure to fill your water tank before arriving (there's no potable water at the dump station, either). *LOTS* of hiking and horse trails throughout the park. The mountain biking trails were closed during our visit. Limited cellphone coverage (3G was spotty). The Ranger and local Sheriff made several drives through the park. Overall, another top-notch experience at an NC State Park. We camped at Medoc Mountain State Park in a Tent Trailer. Only about 20 minutes off of I-95... if you're looking for a nice stopover where your awning doesn't touch your neighbor's rig, this is the place for you. Apparently NC SP's recently changed their fee structure so that they charge more on weekends and holidays and less on weekdays. That makes this park a great deal on weekdays, at only $21/night including tax and day fee. The weekend/holiday rate is $25. This is for Electrical hookup. It is a very small park, with only 12 Electric sites and a total of just 34 sites. Shared water is available, as is a decent dump station on the way out. Sites are gravel and most are fairly level, although a few will require some effort to get level, especially if you have a long wheel base. Most sites get a fair amount of sun during the day, with some parts of the day more shady, depending on orientation. OTA TV good. Verizon signal good. 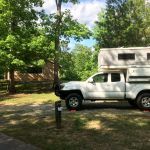 We camped at Medoc Mountain State Park in a Motorhome. Very nice, well kept. Only noise was the wind. 4 campers in park. Water is NOT on each site. Outside ring sites are nicer. Would suggest staying on far side of loop from group camps due to noise if occupied. Low or no cell signal. Nice trails and stream. Stars are awesome. 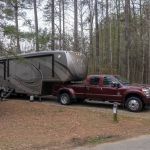 We camped at Medoc Mountain State Park in a Fifth Wheel. 20 min to Aunt Ruby peanut plant in Enfield. Very good nuts. Very clean and nice park. If you want to get away from it all it is great ... No cell phone and big sky. Was a bit mislead thinking my site had water. Water is available throughout the park, so fill tank before set up or coming into park. Great park! We camped at Medoc Mountain State Park in a Motorhome. Just go and relax, get away from the cell phone and enjoy a trail. Very nice park nestled in the mountains. Nice level sites. We stayed one night as we traveled from Florida to Massachusetts. Very clean and secure. 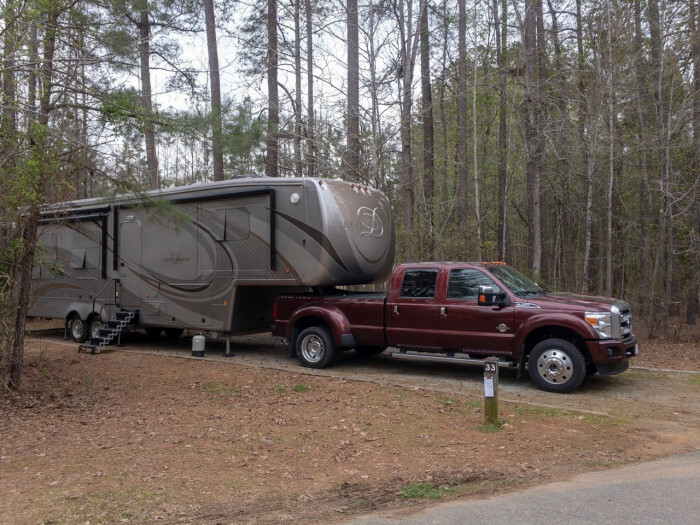 We camped at Medoc Mountain State Park in a Fifth Wheel. There's not a lot to do but if you like tranquility you will love this place. Typically there are only two or three rigs there on weekends! It's right off I95 but several years ago they took down the signs to maintain them and never put them back up. Nice walking trails and a nice fishing creek. The $14 rate was a senior rate with electricity. We will visit it again this fall. 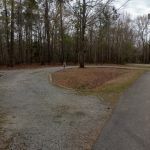 We camped at Medoc Mountain State Park in a Motorhome. My wife, 7 year old daughter, dog, camped here twice this spring while testing out our RV. Our experience was very pleasant. It's very quiet and there's not much to do. We hiked a little, flew a kite in a big open area, picniced, and at night grilled out, had a nice campfire and roasted some marshmellows. Basic camping experience from my point of view. The sites are fairly large and campers were well spread out. When we visited a scout group was camped in a separate group came so they weren't in our way. I will agree with the previous poster that the park ranger is young, well armed, and not particularly talkative. He wasn't unfriendly to us, however. We kept our dog on the leash at all times and had no issues. Highlights were a stary sky, peace and quiet, and no line at the dump station. It's only about an hour from our house so we'll definitely return. 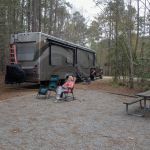 We camped at Medoc Mountain State Park in a Motorhome. Are you affiliated with Medoc Mountain State Park ?